Email is just as much about the people you communicate with as it is what you communicate about. We think it can be helpful to view relevant information in context, which is why over the next two weeks we’re rolling out a new people widget located on the right hand side of your messages. The people widget surfaces content from colleagues and friends that is already available to you but may be hard to find and makes it easier to connect with them. Next to every email message you can now see contextual information about the people in that conversation including recent emails you received from them, shared documents and calendar events. You also have quick access to a variety of ways to communicate with individuals, start a group chat or schedule a meeting with groups of people. 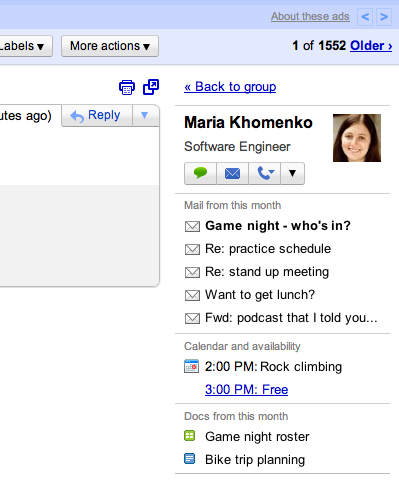 We hope the people widget will improve your Gmail experience and we’re eager for you to try it out. I dig the concept but am a little wary how this will jibe with the Multiple Inboxes lab, which I use religiously. Awesome. This looks very interesting. how do we enable this? when will this be rolled out? how about a extra tab if both contribute to the same Google code, may be integrate orkut (or fb if you want to). Public twitter conversations (may be in the same tab as G talk). Further more luxuries could include youtube vids liked by the email sender or even uploaded by them and any unread/unheard G voice mails left by them for you prop up when you chance upon their mail. this is huge!! cant wait to cjeck it out! Looks like it only shows up when you're on a specific email, not in the Inbox view so Multiple Inboxes lab feature might still could possibly keep working-ish. This will be useful for handling our clients. Thanks Google. Like all the other contact sidebar widgets that are cropping up, this is a really useful idea, and I love the fact that it's integrated directly into Gmail. If it's not able to also show me information from other social services like Facebook, Twitter and LinkedIn, though, then it's much less attractive than the other options. Getting that social context is much more valuable to me than the email stats, etc. I've used a number of methods to get this functionality over the years, most recently Gist.com which works really well, but I'd quickly switch to the integrated solution if Google nails all the right features. 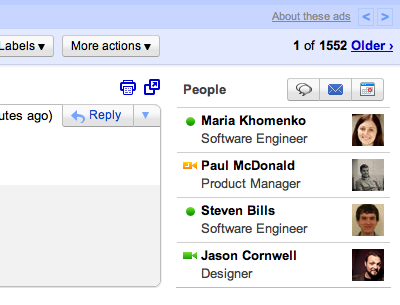 I hope that Google Contacts is updated to include social networking and CRM-type features, too. So, Where do I activate it? 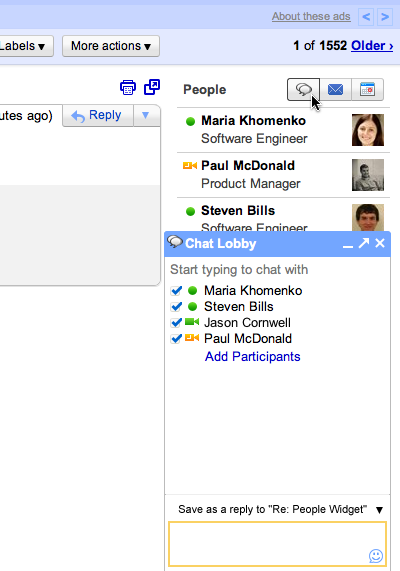 So this will be available for Gmail and Google Apps accounts? Just wondering, will there be an option to turn it off? Say a user has trouble getting used to it, or doesn't think it's particularly useful for them. Other than that, it's a GREAT idea! I especially like how you can see other mail they have sent. What a great way to find conversations! When will this roll out? I also use Multiple Inboxes and-until today- used Right Side Chat. I took it off because I was eager to see this in action, but no can do yet. Please let us know! When will this show up in Google Apps? This looks very impressive. I already use Rapportive which works in a similar way. I wonder if these two will clash. how I can enable this add-on? I've got a question though: will it break the "Right-side chat" lab ? (I think so, but I ask anyway ;)). I need another to select emails to forward at once to someone else! When will you implement it? How can I get this now!?!? So is this a Rapportive killer? will it be able to connect to facebook, twitter etc? I can't see it, neither in Labs nor the regular mail. Should it be already activated? When is it going to be available ? Should this be working in Google Apps yet? I use Mailplane to access my Gmail, and I don't see anything. I can't see on my Gmail Labs. When will we start seeing this? Pretty useless for me. I'd like to disable it. Not a fan of the feature. Disabled it in gears, but my screen estate is still taken. Instead of showing more of my email message, I just have white space. any idea when this will be live in the united kingdom? Need this asap... Its been more than 2 weeks???? It is more than 2 weeks now. This does not even appear in google apps account that I have. When can we expect this to be launched as default for all users. I'm not seeing this in my Google Apps account in US. Is it available for me yet? not seeing people widget yet.. how do I activate it? I really dislike it and wish it was an option and wasn't automatically turned on with logon. Is for only Gmail Enterprise? The widget is good, but for those of us who don't want it, there is still one major problem: there is always the white space reserved in the page layout, even when it's off. I'm using Google Apps Enterprise, with all ADS disabled, but the useless white space is always there. This ruins the interface and disallows for the shrinking of the webpage since it always crowds out the inbox.